NEW BEDFORD, Mass. — This small seaside town of about 100,000 inhabitants was recently rocked by the murder of Bernadette “Bunny” De Pina, mother of one of the main suspects in an alleged gang slaying. The tragic events have drawn national attention and have been the main headlines in the local press. Communities throughout the country have been grappling with similar acts of violence, mainly affecting the young and very young. Almost every day a prayer service or a vigil takes place here. A recent march through the community included the participation of the new mayor, Scott Lang, local politicians and clergy, scores of residents and some young people. More than 30 people have been killed in the wave of violence that has hit this community during the last few years. Nineteen of the killings since 2001 remain unsolved. The communities involved are more than outraged. They demand an end to the senseless violence. 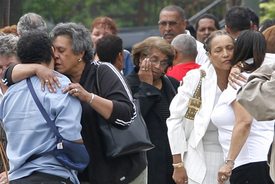 The victims and the alleged gunmen come from poor, working-class African American, Cape Verdean, Puerto Rican, Central American and Portuguese communities. According to the youth group New Bedford Invest in Youth Platform, New Bedford, like many cities and towns throughout the country, faces a 40 percent school dropout rate. Youth face a lack of jobs, teen centers, youth representation in planning and development, quality public transportation and public health education. There are unsolved youth murders and poor youth/police relations. Too few of the city’s teachers and school administrators share the socio-economic background of their students, residents say. Youth are repeatedly forced out of school, in part because of the high-stakes Massachusetts Comprehensive Assessment System (MCAS) exam they have to go through in order to get a high school diploma. A “Certificate of Attendance,” instead of a diploma, is given to students who pass all their courses but do not get through the MCAS. Schools are also rated on the percentage of students passing the tests, and this affects their funding. Community residents and leaders ask themselves: What jobs are available for youths who do not finish school or do not have a high school diploma and cannot get into institutions of higher education? What kind of role models do students have when faculty and administration do not reflect the student body? The mayor and the New Bedford School Committee recently challenged the unfairness of the MCAS, proposing to give diplomas to those students who meet all the academic requirements but who do not pass the MCAS. They have gotten support from the Greater Southeastern Massachusetts Labor Council and certain sectors of the community and local businesses. However, under pressure from Republican Gov. Mitt Romney, who threatened to withhold funding from the school system if such a step were taken, the mayor backed off from the proposal. Instead, he raised the possibility of issuing a “Certificate of Achievement” for such students. The state Department of Education is now discussing raising the scores needed to pass the tests in English and math. This will also affect the science MCAS in 2007 and the history exam at a later date. While all students will be affected, those in urban areas — particularly students of color — will suffer most. Many will be pushed out of school or sent to alternatives schools whose prison-like environment leads many to drop out. The lack of quality jobs, recreational and educational facilities and programs for youth are also problems confronting this New England town. Recently a coalition of youth, the hip-hop youth group Third Eye, Coalition for Social Justice, Communist Party USA, and community agencies like Treatment on Demand and North Star came together to plan activities and campaigns that address the issues of poverty, joblessness, gangs, drug addiction, and child abuse. The group decided to produce a newsletter for the community to offset the negative image of youth promoted by the local press, to work among youth with the help of young persons who have turned their lives around through the arts, music and community activism, and to promote other activities like block parties. The group also emphasized that in order to end the violence, youth must be involved fully in the process to turn things around.